EU Directive 2010/63 is the regulation guiding the protection of animals used for scientific purposes in EU member states. Below we outline some of the key aspects of the regulation. 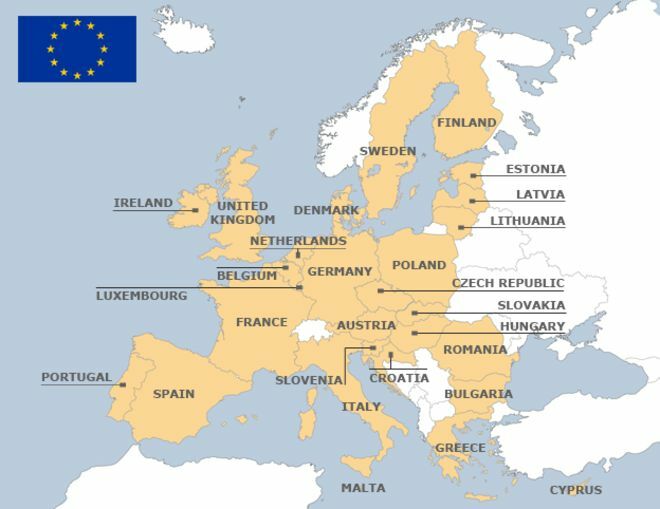 Countries in Europe have differing systems of regulation, but those within the European Union must meet the standards set out by EU Directive 2010/63/EU. The purpose of the Directive is to harmonise standards across the EU, as well as to promote and implement the 3Rs – Replacement, Refinement and Reduction of animals used for research. The Directive was adopted in 2010, but member states were given until January 2013 to transpose these regulations into domestic law. Where specific parts of a country’s laboratory animal welfare standards were higher, they were permitted to retain them, for example, the UK retains its additional protections for cats, dogs, horses and primates. However, overall, the minimum regulations set by the EU are high by international standards. Every aspect from cage sizes to staff training is covered, with the 3Rs of Reduction, Replacement and Refinement at the heart of the Directive’s aims. The Directive requires a risk-based inspection regime and lays down minimum standards for housing and care, and systematic project evaluation. While the UK follows these EU regulations, we have written about their specific rules and regulations on our Animal Research Regulations in the UK page. In March 2017, the UK gave notice of its intention to leave the EU, however, the Government has so far suggested it intends to maintain its current animal welfare legislation after Brexit. “any use, invasive or non-invasive, of an animal for experimental or other scientific purposes, with known or unknown outcome, or educational purposes, which may cause the animal a level of pain, suffering, distress or lasting harm equivalent to, or higher than, that caused by the introduction of a needle in accordance with good veterinary practice. All EU countries must also provide public statistics outlining the numbers of animal procedures completed each year. These are broken down in many ways, including by species, by type of research, and by severity. Speaking of Research provide analysis of these national statistical releases, which can be found on our Animal Research Statistics page. Across the EU, mice, rats, birds and fish tend to account for over 90% of the animals used in each country. Scientists must also produce a non-technical summary of their experiment – essentially an abstract stripped of esoteric language so it can be understood by a layman. In countries such as the UK, these are made available on the regulator’s website for the general public to see (UK example). Licensing procedures differ between countries. Member States are required to establish national committees to give advice to the competent authorities and animal-welfare bodies in order to promote the principles of replacement, reduction and refinement. A network of national committees is intended to facilitate the exchange of best practices at the level of the Union. Member States must ensure that each breeder, supplier and user sets up an animal-welfare body. The animal-welfare body shall include at least the person or persons responsible for the welfare and care of the animals and, in the case of a user, a scientific member. The animal-welfare body shall also receive input from the designated veterinarian or a suitably qualified expert, where more appropriate, who is charged with advisory duties in relation to the well-being and treatment of the animals. Researchers must estimate the likely level of ‘pain, suffering, distress or lasting harm’ to the animal when applying for a licence. After a procedure is complete, a retrospective assessment of suffering is also required. The results of this retrospective assessment, which classes procedures into ‘mild’, ‘moderate’, ‘severe’ and ‘non-recovery’ (where an animal is anaesthetised throughout the procedure and not subsequently woken up), are made public in the national statistical release. The development, validation and implementation of alternative methods is promoted through numerous measures, such as establishment of a European Union Reference Laboratory for Alternatives to Animal Testing, which is supported by laboratories within member states. EU members are required to promote alternative methods at a national level. For example, where appropriate, the tissues of research animals that are killed are reused to create in vitro assays. The 3Rs permeate the Directive and this is made explicit in article 11 of its preamble. Directive 2010/63/EU – Preamble. Section 11. Directive 2010/63/EU – Preamble. Section 13. This principle is reiterated throughout the Directive including with regard to methods of killing, weaning ages and minimum cage sizing. 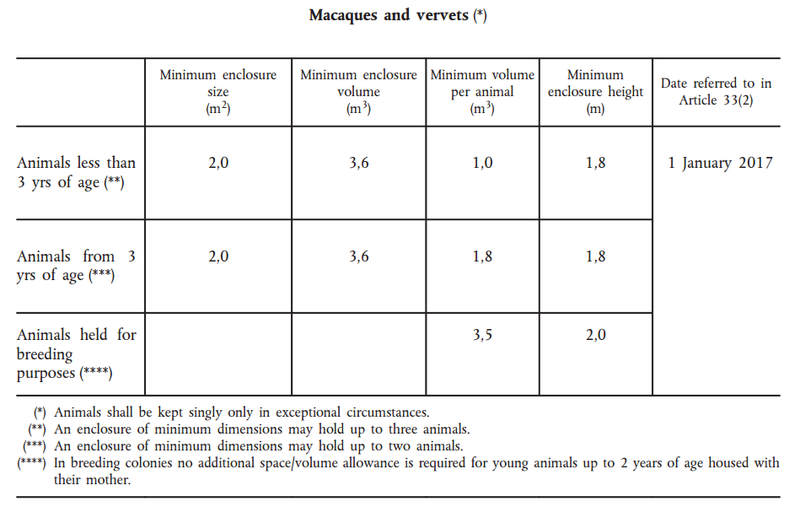 Here is an example of minimum caging sizes for macaques and vervet monkeys. Monkeys account for about 0.05% of research on animals in the EU. Similar guidance exists for other species (Directive 2010/63/EU – ANNEX III, 3.7 Section B). The use of great apes (chimpanzees, gorillas, orangutans and bonobos), as the closest species to human beings with the most complex social and behavioural skills, is permitted only for the purposes of research aimed at the preservation of those species and where action in relation to a life-threatening, debilitating condition endangering human beings is warranted, and no other species or alternative method would suffice in order to achieve the aims of the procedure. The Member State claiming such a need should provide information necessary for the European Commission to take a decision. No wild-caught monkeys can be used in research. Monkeys must be the offspring of animals bred in captivity. Directive 2010/63/EU – Preamble. Section 10.